What is a SCART Switch? If you own a DVD recorder, Video recorder, Satellite TV box, PVR, Freeview box or games console, chances are, your TV set doesn’t have enough spare inputs to handle all of your kit. For that reason, you may need a box that allows you to switch between inputs. 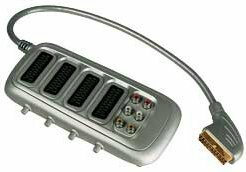 Typically, a SCART switch box allows you to plug in multiple SCART sockets, and connect them to a single SCART socket on a TV. Manual switches don’t require any extra power supply and will allow you to connect either 2, 3 or 4 SCART sources to one TV. You press a button to decide which SCART is routed to your TV. SCART leads have 21 pins, and are quite clever. Pin number 8 is called the ‘switching pin’, and when you turn on a piece of equipment, a change is made to the pin 8 signal. The upshot of this, is that some SCART switches can detect when a piece of equipment is turned on, and switch to that piece of equipment. For example – let’s say you are watching a DVD via SCART. If you now turn on a satellite receiver box, the satellite box will send a signal on pin 8, and the SCART switch box will switch from DVD to satellite automatically. If you have an automatic SCART switch, you’ll find that if you are watching a DVD via SCART, you can switch to satellite by turning on the satellite box using the satellite remote. Much easier than getting up to press a button. Automatic SCART switchers are available from Maplin.co.uk and at Tvcables.co.uk. We recommend: The Bluedelta Smart-SCART. This allows you to connect four SCART leads to one TV… Unlike many of the SCART switchers on the market, this one is fully automatic – it detects which piece of equipment was just switched on, and makes the SCART socket live – a little red light indicates which SCART is active. There’s also a record loop – so you can get your video or DVD recorder to record from one source, whilst you watch another source. If you happen to have a Sky box, or a suitable Freeview box, you may be happy to know that this box works well with the PhantomPLUS (well, it’s made by the same people). Typically, these are boxes that sit with your other AV equipment and have a small remote control that allows you to select what source gets switched to your TV. These are generally the more expensive option, and mean you have yet another remote control to clutter up your lounge. Remote control SCART switchers are available from Maplin.co.uk. The 6-Channel remote control switcher box is available from Maplin.co.uk. If your question isn’t answered here, please ask in our forum, and we’ll try to help. I have bought a dvd player & scart extension lead as my tv only has one scart socket which is currently hooked up to a virgin box. Do I plug the scart extension in to the back of the tv & then run virgin & dvd out from the extension lead. Or something else. To connect two devices to a TV that only has one SCART socket, you’ll need either a switch box or a splitter, as described above. The box or splitter would be plugged into the back of the TV, giving you two sockets instead of one – The Virgin box goes into one, and the DVD into the other. Hope that helps. Your page title is misleading you only explain switchers and don’t even mention adapters or splitters let alone explain them. I was hoping to read about splitters (1 output to 2 inputs). I have in the past bought and used two different Scart splitters. Each was used on completely different equipment. In each case one side of the splitter worked well but the second dropped the signal to an unusuable level. (It was the sound side which suffered – very little volume. I now have a third set of completely different equipment and find that a Scart Splitter would help to avoid unplugging and replugging. What should I be looking for to ensure quality is not compromised? I like your description of the automatic splitter. This may work but would quality of signal suffer?. I have a security AV system with the female scart output & I need to run the security system to two seperate monitors continually, So signal input with a dual adaptor with both female outputs running at the same time. I have searched the internet but have not yet found one, So is there such a splitter on the market ?. Hi, I was hoping your expertise may help me with a problem I am having. I am running a two gaming consoles, both via RGB scart through a manual RGB scart switcher. However I have an issue with one of the consoles. One console works fine through the scart switcher, however if I plug my other console through the scart switcher I get very bad checker-boarding on the image. If I plug the same console directly into my TV it works perfectly. The only thing I can think of is the console I am having an issue with uses sync over composite, while my other console that works fine though the switcher is sync over luma. Could the sync on composite be the issue, maybe interfering with the scart switcher? If so would a sync stripper on scart cable making it pure sync be the answer?